The Carson Nature Center was originally located a few miles away from where it currently sits. The home was built by the Carson family in the 1950’s and donated to the City of Littleton in 1982. The city converted into a nature center where students and visitors can come to learn about ecosystems along the Platte River Basin. The second level is used as offices for the park service. The exterior was previously treated with linseed oil and various other stain products. The result over time was severe mildew growth on the surface and a blotchy dark appearance. The Swedish- Cope style logs were still structurally sound and no log replacement was necessary. 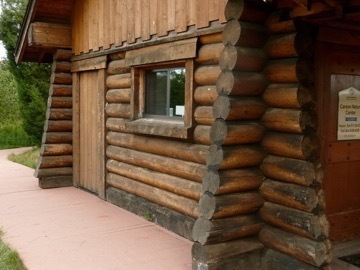 The logs had never been chinked resulting in significant air infiltration. Larger checks had opened up on some logs and water infiltration was a concern. The city elected to do a full exterior restoration which involved the removal of existing finishes, chinking/caulking log joints and checks and applying a natural looking stain product that would be easier to maintain in the future.